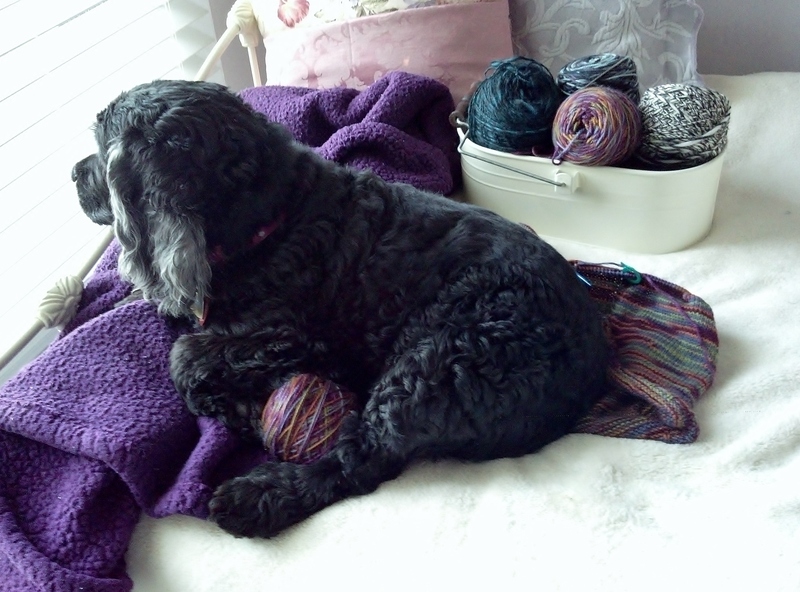 I realized that I’ve yet to have a knitting-related post (it is Penny’s Purls, after all). 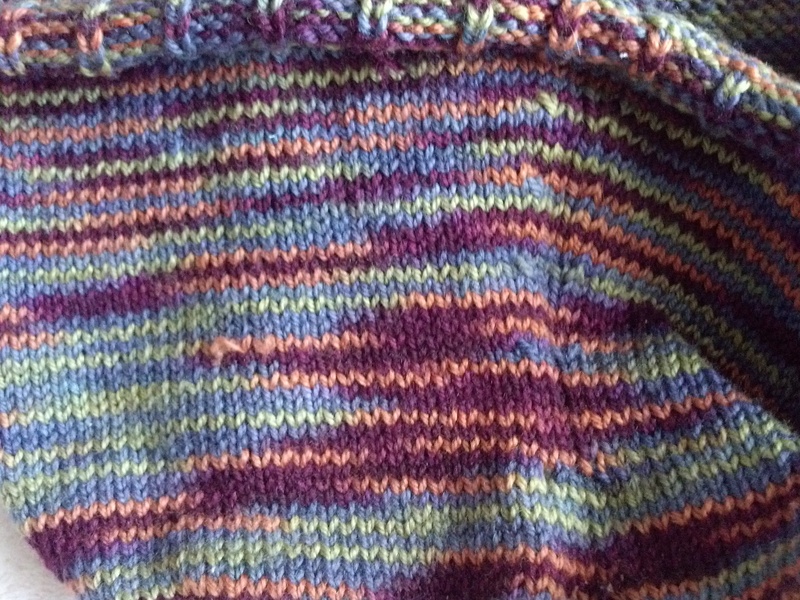 So, here’s the latest project on my knitting needles: the Aleita Shell (pattern by Bonne Marie Burns). The yarn is Lorna’s Laces Shepherd Sport in Rockwell. I got the pattern from a back issue of Interweave Knits magazine–luckily it’s still available on Ravelry. I must confess I have a phobia about knitting clothes. Three years ago, I tried to crochet a tunic and I screwed up so badly I had to cut the bodice off . (Trust me when I say, if a pattern says swatch, you swatch.) I have not attempted clothes since. It was time for attempt #2. I chose the Aleita Shell because it was cute but not intimidating. As for the yarn , you can’t go wrong with Lorna’s Laces. I also love Jimmy Beans Wool, which is why I had so many rewards points to use on skeins of the Shepherd Sport. So far the sweater is turning out pretty nice, but I haven’t gotten to the hard part yet … and I’ve come too far to have it become another tunic-turned-unfinished project! If I’m lucky, I’ll have the thing done by fall, right when the leaves start matching the colors in the Rockwell yarn. That’s a happy thought. 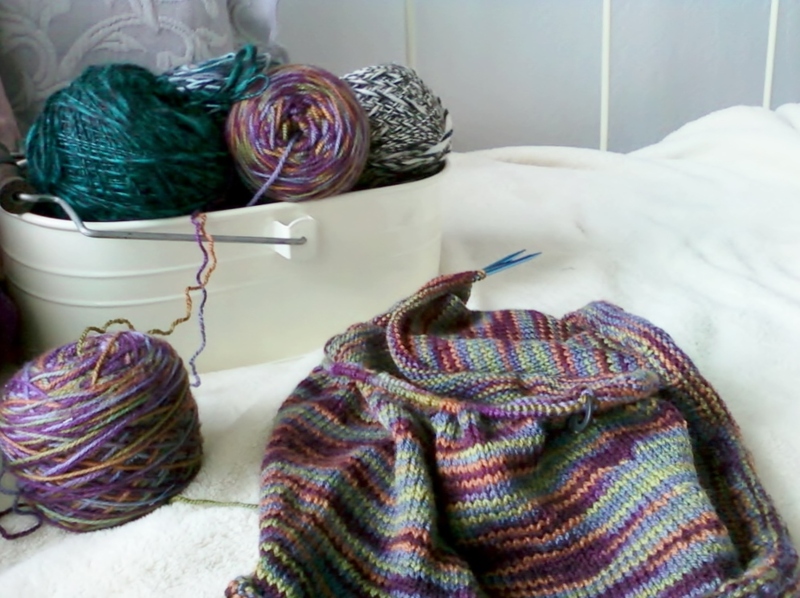 Linking up to Work in Progress Wednesdays at Tami’s Amis. Penny attempted to photo-bomb me. Apparently I took the best sunny spot on the bed. I love the colors in that skein. Good luck with the sweater!